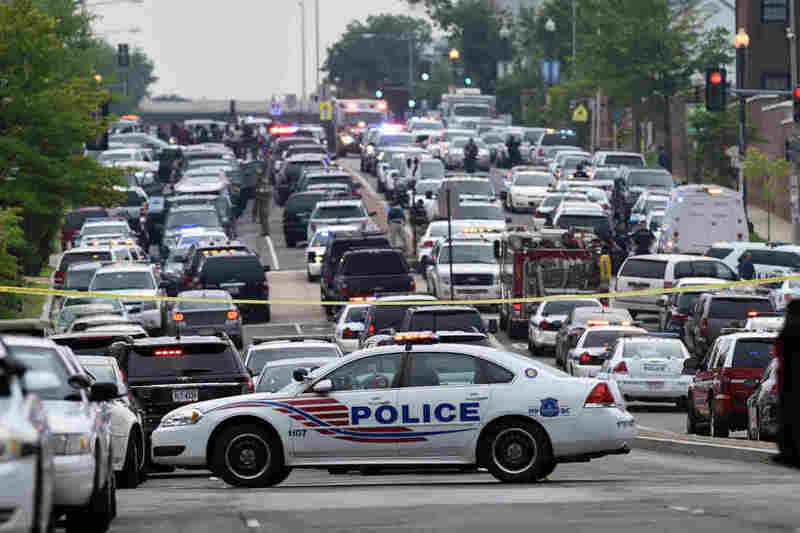 Police Issue 'All Clear' At Washington Navy Yard : The Two-Way Report of shots being fired at the site of a 2013 mass shooting brought a swarm of law enforcement personnel, emergency vehicles and reporters to the scene. Police vehicles block off a road near the Washington Navy Yard in Washington, D.C. A lockdown is underway at the Navy Yard campus after a report of an incident. The Washington, D.C., Police Department has issued an "all clear" at the Washington Navy Yard, the scene of a 2013 mass shooting, where there was a report today of possible gunshots. #3 of 3: have found no evidence of a shooting or injured personnel. The scene has been turned back over to the NavSea Command. "At this time, there is no evidence of gunshots. There is no evidence of a shooter. And there's no evidence of any victims today," District Mayor Muriel Bowser said at a news conference. The U.S. Navy also confirmed there was no sign of a shooting. "All personnel OK," the Navy said in a tweet. "Follow-on NCIS investigation ongoing." The report that came in at 7:29 a.m. ET resulted in a lockdown/shelter-in-place at the Navy Yard. "We've spoken with the person who called and have no concerns of a hoax, whatsoever," D.C. Police Chief Cathy Lanier said. Police, the FBI, federal marshals and ambulances swarmed to the scene, and police blocked nearby streets, as speculation built over what — if anything — was going on inside. In 2013, a mass shooting at the Navy Yard killed 12 people, along with the gunman. Vice Adm. Dixon R. Smith, commander, Navy Installations Command, told reporters that experience helped the Navy provide "have counselors and chaplains" to those who were evacuated from the Navy Yard.